I like tattoos and I cannot lie. And other people can't deny. Bzzz... Tattoo! Zap: No Tattoo. Why I wanted to remove my tattoo. Jimmy Buffett could not have said it better: "It's a permanent reminder of a temporary feeling." 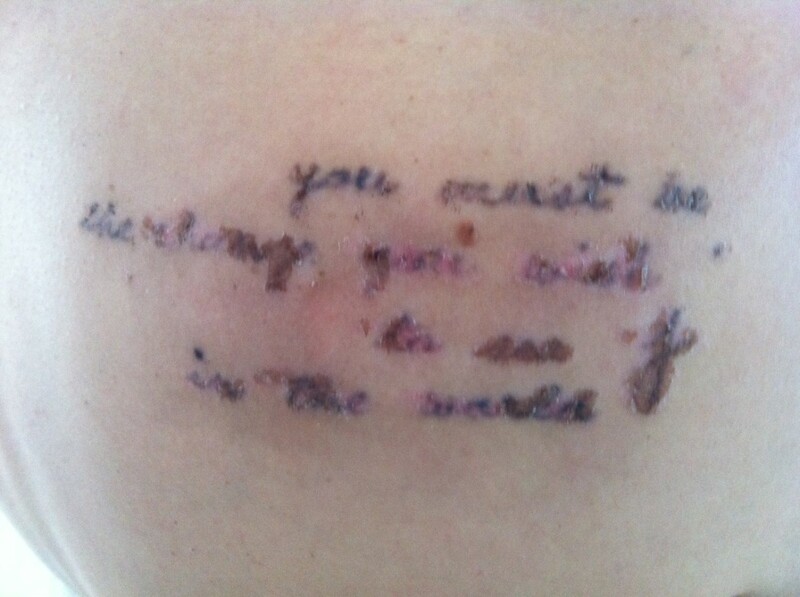 My tattoo removal nurse told me about this lovely quote the last time I went in for a session to have my tattoo removed. 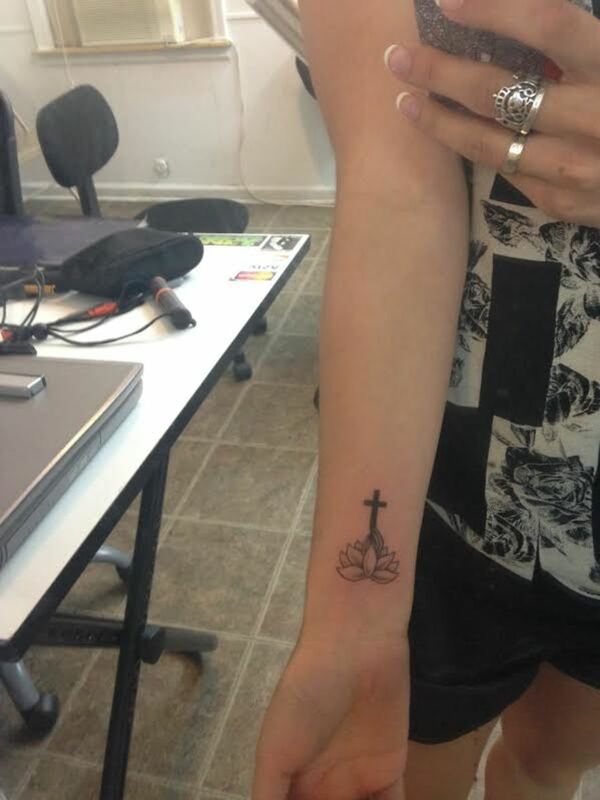 That session was pretty much the first time someone had seen my tattoo and not asked what it said. It was refreshing. 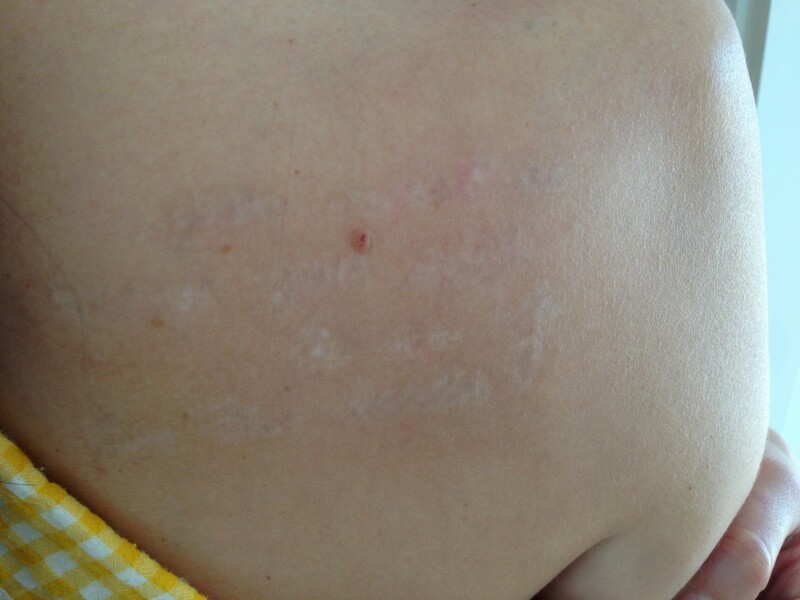 I had gotten used to strangers touching my shoulder and asking me what it said, and I really did not want that anymore. I really didn't want this permanent reminder of fleeting, temporary feelings from college anymore. 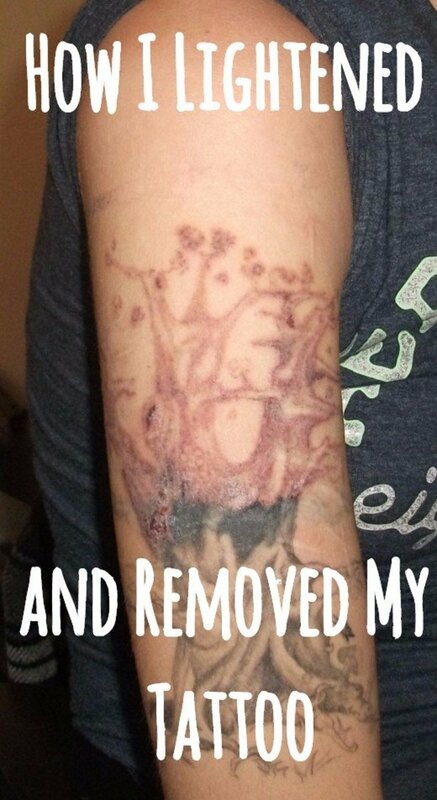 Why I chose laser removal. 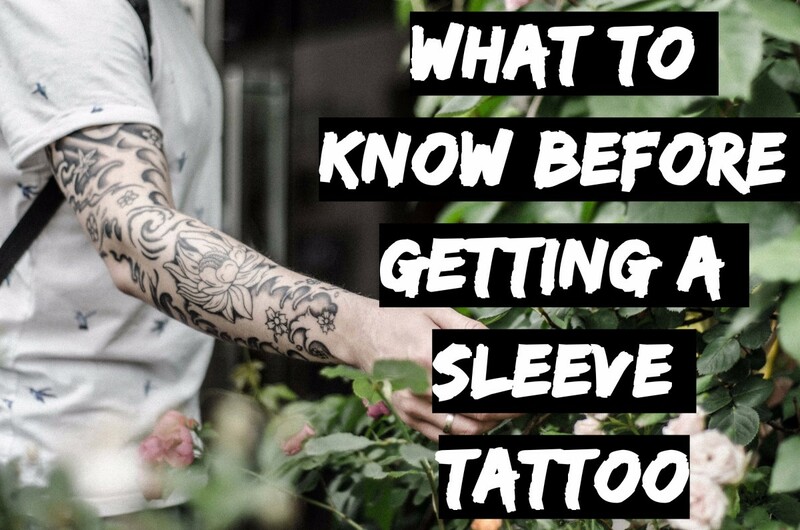 I did as much research as the next person and decided not to try any tattoo removal creams and also decided not to use the laser tattoo shop on the shady side of town. I opted for a suggestion from a friend. She had a very colorful sleeve of a lucky cat which had been substantially faded via laser tattoo removal. Perfect! I was sold. How many laser treatments it took to remove my tattoo. I started off by purchasing six laser treatments. My nurse told me that it shouldn't take more than nine to remove my tattoo. 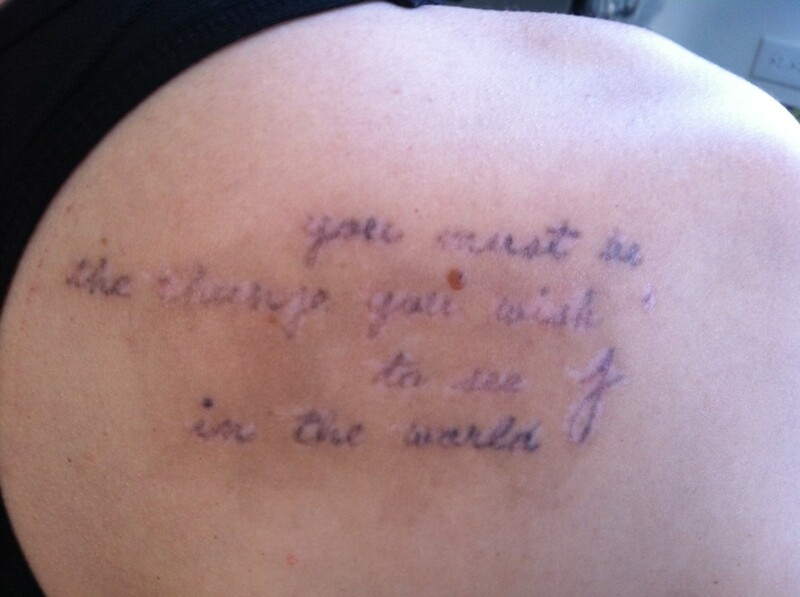 She even said that it was better that it was only black ink. 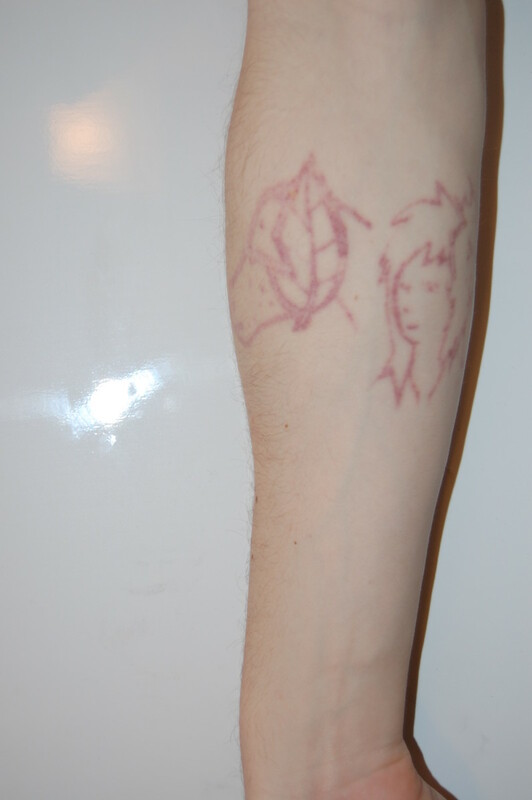 The only problem I might have experienced was that because my tattoo was still fairly new (2 years old), it might have been harder to remove (i.e. require more treatments). This detail was not enough to deter me. The cost hurt a little, but not as much as the treatments. Six treatments = $620. Charge it! I had to prepare for the excruciating pain. The first thing I had to do was ice down the tattoo with a plain ice pack. This took about 5 minutes. Then I put on the grand-daddy of all ice packs because apparently, ice gets colder. This ice pack made the fluid under my skin feel like it was crystallizing. It was like bits of glass formed and had a party underneath my skin. I'm positive that if this ice pack stayed on any longer, the nurse would be able to chip away the tattoo along with half of my shoulder. The nurse then handed me a really awesome hybrid pair of sunglasses/goggles (sunoggles?) and started lasering away. Now, before I go into what it felt like, I should explain the process (in the most basic form). The laser specifically targets and breaks up the ink particles underneath the skin. After the procedure, the body takes those bits and pieces away via your lymphatic system (umm, your fluid system). So, theoretically, you are left with clean, un-tatted skin. Now, the part you've been waiting for: The Pain. Oh, the pain. As the laser went off, I heard each pulse zapping, saw the bright light pulsing, felt the laser piercing into my skin, and smelled the skin burning. Yes. The smell of skin burning. In parts, the skin was still extremely numb from the super ice. In other parts, the laser felt like a small, thin dagger dripping with acid being pierced into my skin every time it pulsed. BUT! It was over in a flash! (Ba-dum-tsh!) Afterwards, the nurse put ointment over the area and covered it with gauze. By the time I got home, the tattoo was dripping in blood (please see the picture at the top of this article) and throbbing in pain. By the end of the first week, my skin already started looking normal and the tattoo started going away—not fully, but a bit. After four weeks, I went to my next appointment. No pain, no gain! 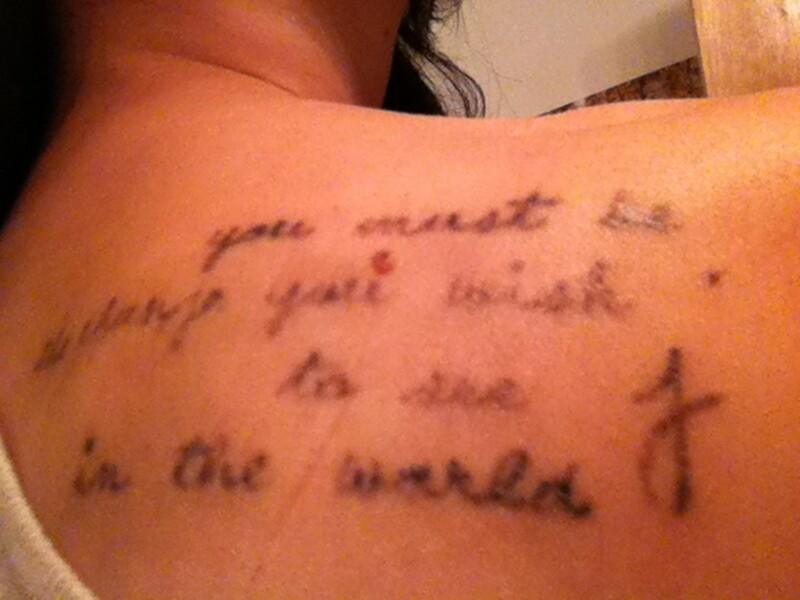 After treatment #4: All healed, body taking the ink away. 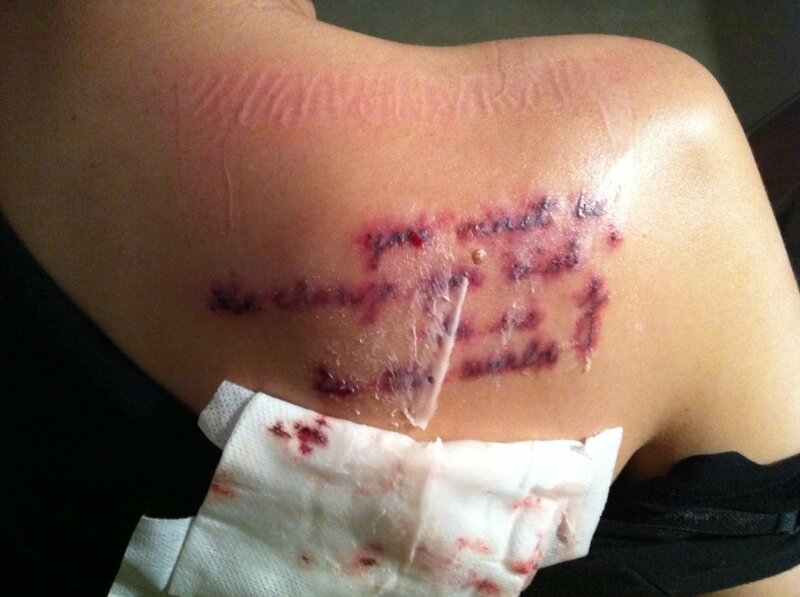 After treatment #5: A mostly scabbed-over tattoo. Hyperpigmentation is visible, but the tattoo is slowly fading. This time, my technician (who also happens to be a pediatric nurse) used two different lasers - one to target black ink and one to target brown ink (doesn't hurt as much- yay!). 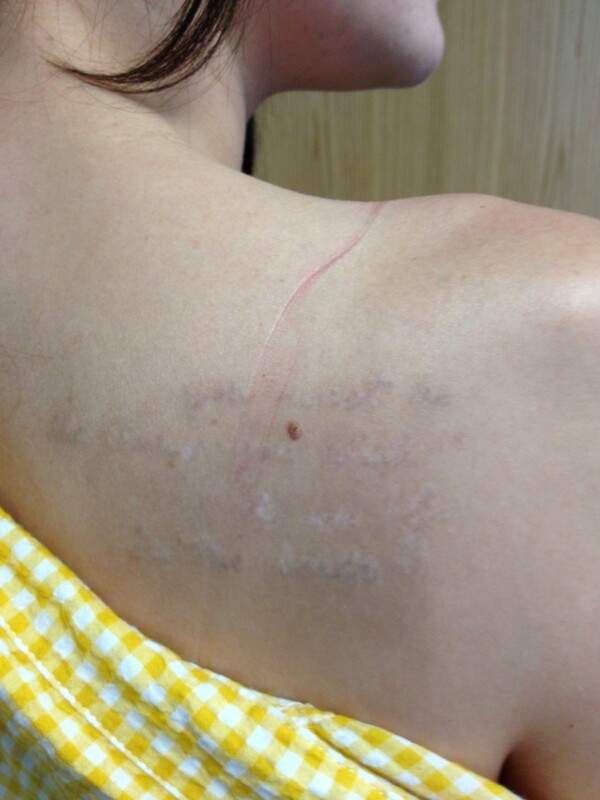 After treatment #6: Healed and waiting. Hyperpigmentation and hypopigmentation visible. My nurse told me that we had to wait 2 to 3 months for my melanocytes to start making pigment again. If we lasered them too much, then the hypopigmentation would be there for a very long time. After treatment #7: A long time waiting. 8 months after the last treatment, I still had hypopigmentation and hyperpigmentation. My body ate up a lot of the ink and was a time to get another treatment. We learn two things from this picture: #1 My tattoo was almost gone! & #2 I really like my yellow plaid shirt. Would you laser off a tattoo? Uhm, sounds like it hurts... I love my tattoo! WOWW!!!! It looks great! I tattooed my boyfriend's name over my heart, and he ended up cheating on me with my bestfriend of 13 years. 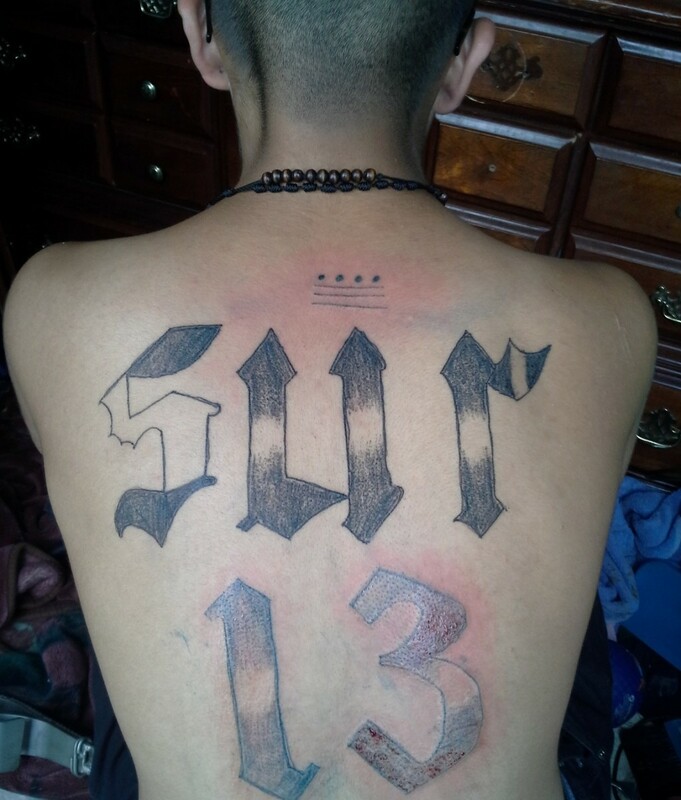 I wanted to have this ugly name tattoo removed but was very skeptical of it being completely removed, and afraid it would scar. I am so thrilled to see it really does get removed and doesn't leave scarring. How painful was it? Can I drink a long island iced tea (2) before going in for my session? how is the hypo-pigmentation going? are you doing anything to help it progress back to its normal tone? Thanks for posting that picture, I was so curious to see & now I'm just amazed! That's really incredible. Why is it that you say you may need 2 or even 3 more treatments? I think it looks like once the hypopigmentation cools down it will be completely gone! Just my opinion..
You should post a more recent photo! It looks like it's coming along fantastically! Congrats!! Thanks Winnie! That's pretty much what I did...it's only day 1. So looking forward to when I can see actual results... Patience, OHMMMMM. For the healing process, besides doing what your nurse tells you, I just try and leave it alone! haha! I usually take my bandage off in the evening before I go to bed and then just let it heal itself after that. Good luck, Davis! It sounds like you are in the same situation I was in. you healed nicely! just had my first treatment...Anything you can recommend for the healing process? 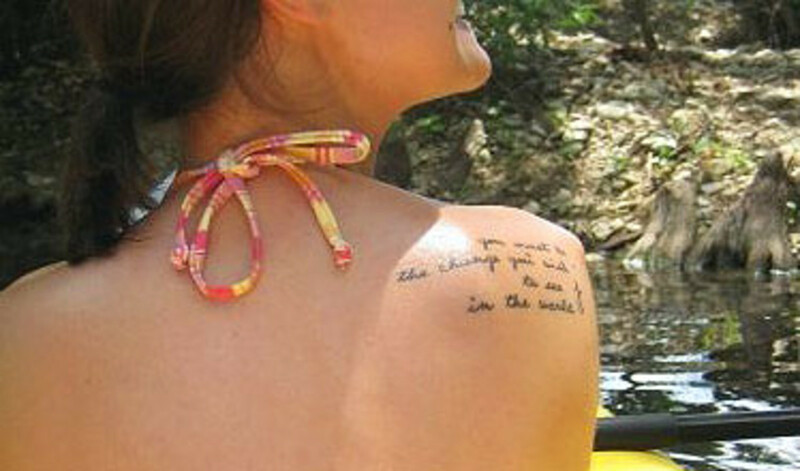 I to have black ink lettering only 2 years old. Wow!! That's really great that it ended up being so cheap. I was afraid that one treatment would end up being $600! Good to know that there are places out there that are reasonably priced! My tattoo that I want to have removed is script too, & it covers a big area, but realistically it's not very much ink, it's just spread out thinly. Hopefully I'll have luck like yours, with the price & the amazing results! It was a while ago when I first signed the deal, but I remember going when there was a special going on... the lady was really nice too - since it was script she kinda decreased the "area" that she was charging because of all the blank spaces in between. She's super cool. How did it only cost you $600!? That's so cheap! How much does the place charger per square inch? I hope so too! Good luck!! Thank you! I'm still getting treatments at Medermis Laser Clinic (http://www.medermislaserclinic.com/) - the lady that does my treatments is awesome! I love this post! Where did you go to have your tattoo removed?